Home > Life, The Universe, & Everything	> Reunions: A Troublesome Trio Traipsing Toronto Together Again! Reunions: A Troublesome Trio Traipsing Toronto Together Again! April 2006 at the Frog & Firkin in North York, Toronto: Akiva on my left, Jon on my right. Wow, since that picture above was taken it has been 5 long years. I have seen both of these guys individually since this picture was taken but we haven’t all been together in the same city since April 2006. Back in the day (which was a Tuesday, if anyone ever says “back in the day”, the day they’re referring to was a Tuesday) we used to be inseparable. I met Akiva when he and his family moved from South Africa to Canada in 5th grade and then met Jon in high school in 10th Grade. 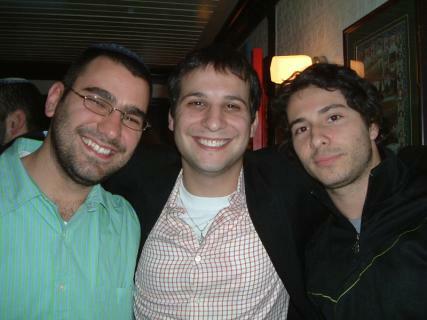 When Akiva came to our high school in 11th Grade a lifelong bond was formed between the three of us. We became as close as brothers and, quite honestly, I talk to them more often these days than I talk to my brothers by who are genetically my family. We went to Israel together after high school and spent the year touring around Israel and having adventures. But we haven’t all hung out together since they were both in town when that picture above was taken. Now, Akiva still lives in Israel and is married with 3 kids – and is quite a bit more responsible than anyone ever thought possible. Jon lives in London, England and is still living the single life with a girlfriend every now and again much like me. I, as you all know, live in Toronto and as previously stated am still unattached. This also reminds me that I have to go visit them in London and Israel at some point in the future – I still haven’t been back to Israel since 2001 and I’ve never been to London. Have a great rest of the weekend folks!